If you’re asked to think of the ocean, what sorts of images come to mind? It might be an Impressionist seascape, or a glossy photograph of a beach at sunset. Depending on how morbid you are, it might be the movie Jaws. But it’s very likely that when you think of the ocean, one of the images that scrolls through your mind is an early nineteenth-century Japanese print, Under the Wave off Kanagawa, by the master print-maker Katsushika Hokusai. In the first episode of Art History for All, I talked about Leonardo’s great lady, the Mona Lisa, and how frequently that image is reproduced and reimagined. Hokusai’s Great Wave, as it is commonly known, rivals the Mona Lisa in terms of the frequency with which it has been reproduced, parodied, and slapped onto coffee mugs and mousepads. Some of these reproductions remove a core element of the image: Mt. Fuji, whose peak rises in the distance beyond the wave in the original image, anchoring the image firmly in Japanese waters. Some of these reproductions are really transformations, altering the Great Wave so it becomes part of a different scene or becomes a backdrop for a pop culture reference. For whatever reason, the Great Wave seems more apt for reuse, remixing, and rethinking than other types of images. But why is that? I am greatly indebted to Christine M.E. Guth’s excellent book, Hokusai’s Great Wave: Biography of a Global Icon, for a great deal of the information in this episode, and I highly recommend you check it out. It both prompts and addresses some of the questions that we’ll discuss in this episode, such as: Why do we find the Great Wave so captivating, even when we manipulate it and divorce it from context? What does the fascination with the Great Wave say about how the West views Japan, or how Japan presents and markets itself globally? And how many times can we put the Great Wave on a phone case before it becomes passé? Let’s dive right in to this flood of questions, and explore just how fluid the meanings of this image can be. A description of Katsushika Hokusai’s Kanagawa-oki no namiura, or Under the Wave off Kanagawa, first published in 1831. This description is based on an impression of the print in the collection of the Metropolitan Museum of Art in New York. Born in 1760, Katsushika Hokusai had a prolific career, experiencing the favor of the Tokugawa Shogunate, the military leaders of Japan, for the majority of his life. Over the course of his 90-year life and 70-year career, Hokusai engaged in drawing, painting, and designing prints—according to the preface to the British Museum’s 2017 exhibition catalogue, Hokusai: Beyond the Great Wave, Hokusai designed 3,000 color prints, illustrated over 200 books, and created “hundreds” of surviving drawings and nearly a thousand surviving paintings. Hokusai is better known for his prints than his paintings or drawings, including his very successful painting manual series Manga, or Random Sketches, which is often identified as a precursor to modern-day Japanese graphic novels, also called manga. The Great Wave is part of a series of prints that Hokusai produced late in his career entitled Thirty-Six Views of Mt. Fuji. This series was different from previous representations of Mt. Fuji, because, according to Christine Guth, quote, “few artists in the print medium before Hokusai took note of different angles of vision or the atmospheric and seasonal changes that could inform the appearance of the sacred mountain, nor had they incorporated these features into an implicit narrative of travel.” End quote. Hokusai had depicted Mt. Fuji before he embarked upon the Thirty-Six Views, but the mountain appeared with increasing frequency in his work after he turned sixty. A few years after the first print run of the Thirty-Six Views, Hokusai indulged in one of his periodic name changes, now referring to himself as Manji, and adopted a new seal that featured a stylized Mt. Fuji. Fuji-mania was by no means limited to Hokusai himself: the mountain was the subject of devotional cults, which was no doubt something that the series publisher, Nishimuraya, took into account when he first announced the series in an advertisement in the back of a serial novel. Nishimuraya even ventured to announce that the series might extend to one hundred views, and was not limited to the thirty-six initial images. Forty-six images ended up being published, but the series is still known by its initial title. But not every nineteenth-century Japanese consumer would have bought the earliest and best impression of each print, and, as Christine Guth points out, we don’t really have a record of consumers’ reactions to or reasons for buying the prints when they were first produced. The way that the series was marketed by Nishimuraya is our best source of information for the appeal of the prints. Aside from Hokusai’s name recognition, Nishimuraya made a point of advertising that the prints would be aizuri-e, or images printed entirely in blue. And not just any blue, but a type of imported synthetic dye called Berlin or Prussian blue, which was more intense in color than natural dyes like indigo. The use of an imported European dye in Japanese prints added an exotic foreign flair to the images, and also recalled the fine blue and white porcelain produced in China. From their first announcement, the aizuri-e images of the Thirty-Six Views brought together the native Japanese landscape, including its most famous mountain, and European materials. These intercultural connections are particularly significant given the fact that, since the 17th century, Japan had severely limited its contact with other nations through a policy called sakoku, or “closed country.” Most Japanese people could not leave Japanese territory, and contact with Europe was largely limited to trade with the Dutch via a man-made island in Nagasaki Bay. Sakoku only ended after 1853, when U.S. Commodore Matthew Perry—unfortunately not the same guy who played Chandler on Friends—essentially threatened Japan into opening up to the rest of the world. Using Prussian blue in production, then, immediately increased the desirability of the Thirty-Six Views by connecting it with a world outside Japan that most Japanese had no contact with. The growth of a tourist industry in Japan in the early 19th century helped foster the landscape print tradition in which Hokusai took part, and from very early on, at least according to King, Hokusai and artists like him were interested in cultivating a sense of authenticity in these images. Earlier landscape paintings and prints were heavily influenced by imported Chinese paintings and painting manuals, which based their interpretations of landscape elements on Chinese places. Now there was a demand for and an opportunity to create “true views” of Japan that were less tethered to Chinese influence. In producing the Thirty-Six Views Hokusai linked the idea of a “true view” of the Japanese landscape with the apparent omnipresence of Mt. Fuji, even far in the distance. He even made a point of linking Mt. Fuji to the city of Edo, uniting the urban and the natural, framing the mountain as a part of people’s actual lives. As King notes, this depiction of Fuji as a natural phenomenon and a visible landmark allows the mountain to exist as both something sublime and something everyday, an element that united disparate aspects of Japanese people’s lives and worldview. This strategy is sort of similar to how local landmarks and city skylines are presented in popular imagery today. The Gherkin and the London Eye, the Chrysler and Empire State Buildings, the Willis Tower, the Eiffel Tower, the Space Needle, or the Hollywood sign—their silhouettes and contours are instantly recognizable, and seeing them on a day-to-day basis in the city in which you live gives you the sense that you are in a unique place. The difference between those landmarks and Mt. Fuji, however, is that those are all man-made, and to some extent were made with altering the skyline in mind. Fuji, as a naturally occurring volcanic mountain, has a sense of permanence that those other structures lack. And Fuji is not just a symbol of a single city, but a symbol of an entire country. Today we are probably more likely to associate Tokyo with Tokyo Tower, or the brightly lit signage of Akihabara, or other man-made landmarks, than we are to associate it with Fuji. Tokyo Tower is representative of only a part of Japan—Fuji is representative of the whole Japanese archipelago. We might not consider Fuji to be the tallest mountain in all of India, China, and Japan now—Mt. Everest is over 29 thousand feet in elevation, while Fuji is only 12,389 feet in elevation—but it certainly has one of the most recognizable silhouettes of any mountain anywhere, with its gently sloping sides and the rippling edge of the volcanic crater at its peak. In the context of Hokusai’s Great Wave, that shape almost becomes lost amid the peaking waves of the ocean, and is totally overwhelmed by the large cresting wave for which the print is named. From this perspective, the immortal mountain seems like nothing in comparison to the raging sea, and may not even be recognizable at first as it is printed in the same Prussian blue and white that forms the ocean. Fuji is what firmly anchors this image in Japanese territory, but because the wave so overwhelms it, it is the wave that has emerged as the recognizable element here, an element that does double duty as both a symbol of Japaneseness and a globally applicable symbol of the ocean itself. Now comes the fun part, where I get to tell you all the weird ways the Great Wave has been reproduced and altered in order to advertise, add quote-unquote “Eastern” flair, or add drama and interest to any number of things. Guth talks about this extensively, and establishes that the American interest in using the Great Wave originated in the period after WWII, when we quickly shifted gears from considering Japan an enemy and began to see them as an anticommunist ally. The wave appeared on postcards marking the hundredth anniversary of Commodore Perry’s opening of Japan in 1953, in New Yorker cartoons, and in children’s books like Pearl Buck’s The Big Wave. Japanese artists, for the most part, tended to avoid depicting and remixing the wave, or indeed referencing many of the ukiyo-e tropes that Westerners found appealing, until the 1960s, beginning with the poster for the 1960 World Design Conference, which overlaid the outline of the wave atop a modernist geometric form. From there, Japanese pop artist Yokoo Tadanori took up the wave in some of his works during the 60s, third-generation Japanese-American artist Roger Shimomura used the wave as a motif in a 1974 screen print, and Japanese-born American artist Masami Teraoka uses Hokusai-esque waves in his ukiyo-e-inspired watercolor works from the 1980s onward. Many of these works excerpt the wave without including Mt. Fuji, an assertion that it is the wave itself that is emblematic of Japan, and that it is not dependent upon the mountain to give it a sense of place. It was in the 1990s and 2000s, with the rocketlike ascendance of manga, anime, and Japanese pop culture on the global stage, that the wave got remixed in perhaps its most absurd ways. Guth references a 2007 digital print by Japanese-American graphic design team Kozyndan, entitled Uprisings, that was published on the cover of the fiftieth issue of Asian-American pop culture magazine Giant Robot. In this image, the foam of the wave forms masses of falling white rabbits. The boats are absent and the image is cropped to show only the wave and Mt. Fuji, which has suffered no bunny alterations. It’s just the kind of image parody one might see on a T-shirt or in a coffee table book or something—a nonsensical manipulation of quote-unquote “high art” to create a weird sort of inside joke that you don’t really know the punchline to. The less hipster-y companion to this that Guth references is a parody of the Wave by Brian Chan, The Great Eva off Kanagawa from 2013, which broadens the original image to include a giant robot and a massive alien creature from the hit anime series Neon Genesis Evangelion, which originally aired in 1995. Guth also creates a near-encyclopedic list of all the major entities that have taken advantage of the Great Wave to adorn or advertise their products, from museum shop tchotchkes to sushi restaurants, from T-shirts to Baby Gap onesies, from bicycle shops to Japan’s own tourism board. A quick Amazon search for the term “great wave” adds to that list: canvas prints, iPhone cases, mouse pads, shower curtains, thousand-piece puzzles, pillows, ukuleles, Xbox controller covers, air filtration machines, Playstation 4 console covers, refillable spray bottles, leggings, paint-by-numbers kits, Nintendo Switch covers, dog bandanas, bath mats, and matcha green tea. And that’s not even counting the parodies and reinventions of the Great Wave that pervade artistic corners of the internet. Artist Missy Peña reimagined the image in 2014 as The Great Wave off Kanto, incorporating the water dragon Pokémon Gyarados alongside a number of fish Pokémon called Magikarp. Her images are also available for purchase, printed on a number of different objects to fit one’s fancy. T-shirt company TeeFury, which features at least one new graphic tee every day, has marketed a Super Mario-themed version of the Great Wave, as well as a Samurai Jack version, a Simpsons version, a Legend of Zelda version, a version featuring an anthropomorphized bowl of ramen, a C’thulhu version, a Jaws version, and a breakfast-food-themed version. Much like Brian Chan’s Evangelion image, the nerd community has latched on to the Wave as a convenient vehicle both for parody and for expressing enthusiasm about their media of choice, especially when that media is already Japanese in origin and can therefore be more easily connected with an image that is already considered synonymous with Japan. In these niche revisions, Mt. Fuji, in theory the focal point of the original image, is often obscured or outright replaced by elements that make further reference to the media of choice, like the cooling towers of the Springfield Nuclear Power Plant or the head of a great white shark. The form of the wave is now as much about communicating cosmopolitanism and a familiarity with global cultural heritage and art, as it is about communicating Japanese connections. The same principle has led to nerdy reimaginings of Van Gogh’s Starry Night and Leonardo’s The Last Supper, to name just two. But there is something that’s a bit different about referencing non-Western art than referencing the capital-G Great painters of the Western artistic tradition. Just as using a European dye lent the original Great Wave an exotic flair for Japanese consumers, referencing the Great Wave in the contemporary West draws upon the exoticism we tend to apply to the East. In the course of working on this episode, I went to see Avengers: Infinity War, and one of the trailers before the feature was for the upcoming Shailene Woodley movie Adrift. As Woodley and Sam Claflin cling to life while caught in a storm on a tiny sailboat, the trailer shows a massive wave, rising up as if to consume both them and their craft. I couldn’t help but think of Hokusai’s Great Wave, how this wave onscreen compared, and how, despite being so closely associated initially with Japan as a country and as a concept, the Great Wave has somehow become representative of the ocean in its entirety. It is not just a wave, it is the wave. The Great Wave is the ur-wave, the Platonic ideal of a wave. This highly specific image, one view of a possible one hundred views of Mt. Fuji, reached well beyond the borders of Japanese territory and permeated the global cultural consciousness. Part of the unique situation of the Great Wave is that its status as a print placed it firmly in the realm of the commercial from the very beginning. It did not begin, as many iconic artworks have, as a religious work, or a one-time commission for an aristocrat. This, along with the forty-five other images in the Views of Mt. Fuji series, was an image created for public sale. That it has been reproduced and reimagined so often in the nearly two centuries since its initial release is less of a transformation, or at least a different kind of transformation, than one-of-a-kind works undergo when reimagined for the commercial market. Recognizing the unique situation of the Great Wave as an image and an object provides an opportunity for us to scrutinize how and why we reproduce and transform images in general, and the effect that has on how we perceive those images. There is something much tackier, for example, about owning a mug with the Mona Lisa on it than there is about owning a mug with the Great Wave on it. There is something much more cliché about having a poster of a Monet on your dorm room wall than there is about having a poster of the Great Wave. At least, that’s my perception. And I think the differing connotations of reproducing and remixing Western artworks versus Eastern artworks speaks to a largely Western interest in the East as an aesthetic rather than as a real place occupied by real people. The fascination with anime and K-Pop, and the many, many Instagram posts of Western tourists feeding the deer at Nara or snuggling pandas or riding elephants, are evidence of how we in the West consistently accessorize with or commodify elements of Asian culture in order to beef up our own cosmopolitan street cred. As the case of the Great Wave proves, what we consider hashtag-aesthetic is often so much more complex than it looks, and when we take the time to investigate it, we can discover something new about the image and about our own points of view. Thanks so much for listening to Art History for All. You can find a transcript of this podcast, including links to images and citations, at arthistoryforall.com. You can subscribe to the podcast on Apple Podcasts or Stitcher, and while you’re there, why not rate and review us? It helps us out a lot. 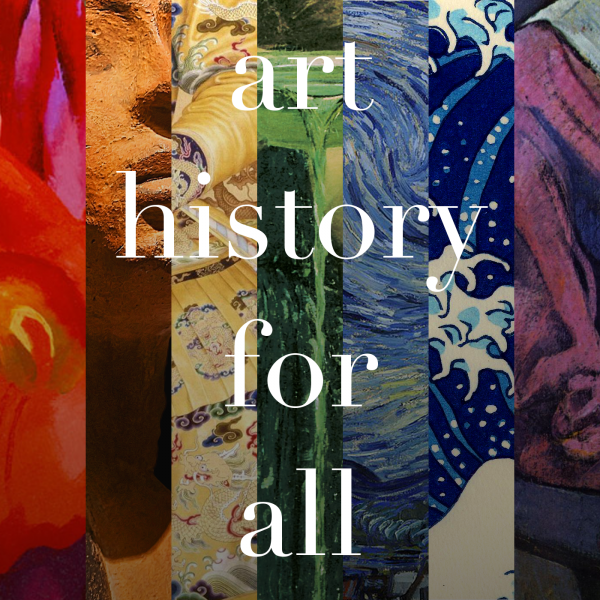 Follow us on Twitter at arthistory4all—that’s art history, number 4, all—for updates about the show and other fun art stuff. This podcast was produced and narrated by me, Allyson Healey. The theme was composed by Bruce Healey. Credits for other background and interstitial music can be found in the podcast description or at the end of the transcript. Make sure to subscribe to the podcast feed so you won’t miss future episodes, and remember to look closely: you never know what you might see. Christine M.E. Guth, Hokusai’s Great Wave: Biography of a Global Icon (Honolulu: University of Hawai’i Press, 2015). Translations from: Wikipedia contributors, “The Great Wave off Kanagawa,” Wikipedia, The Free Encyclopedia, https://en.wikipedia.org/w/index.php?title=The_Great_Wave_off_Kanagawa&oldid=839435251 (accessed May 10, 2018). Roger S. Keyes, “Hokusai: The Final Years,” in Hokusai: Beyond the Great Wave, ed. Timothy Clark, British Museum exhibition catalogue (London: Thames & Hudson, 2017), 8. Angus Lockyer, “Mt. Fuji and the Great Wave,” in Hokusai: Beyond the Great Wave, ed. Timothy Clark, British Museum exhibition catalogue (London: Thames & Hudson, 2017), 75. Guth, 18, and Roger S. Keyes, “Thirty-Six Views of Mt. Fuji (Fugaku sanjurokkei),” in Hokusai: Beyond the Great Wave, ed. Timothy Clark, British Museum exhibition catalogue (London: Thames & Hudson, 2017), 108. King, Beyond the Great Wave: The Japanese Landscape Print 1727-1960 (New York: Peter Lang, 2010), 10.